As soon as my eye caught this dress I wanted to try it on. It was so eye catching, feminine, and yelling SPRING! I would pair this with silver pumps, pearl earrings or silver simple earrings. 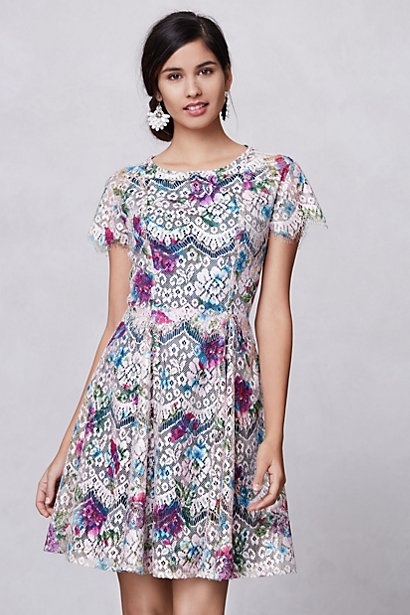 You can wear this to a wedding, brunch or even a baby shower. I wasn’t familiar with who Hunter Dixon is, but then I saw she is a current contestant on Fashion Star. I hope she wins! I love the colors on this tote! It’s perfect for the weekend, the beach or a mini getaway! 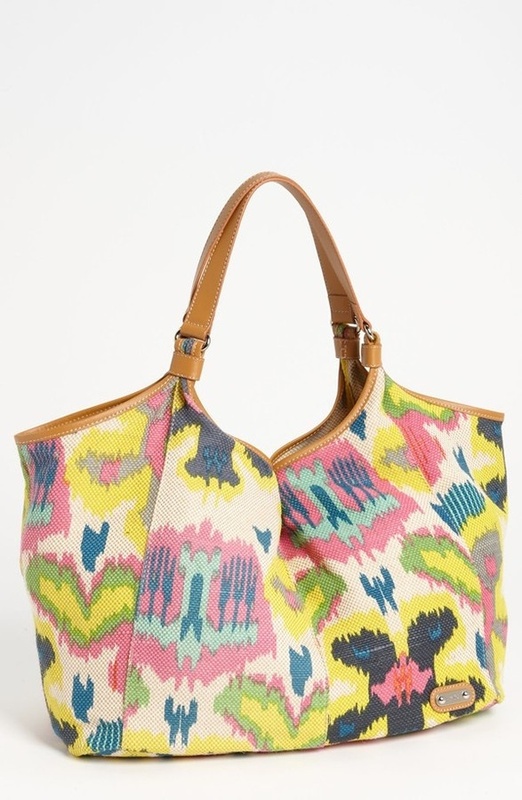 Both of these would spice up any look and the key is to have these as the focal point since they are both busy prints. Enjoy these looks and if you buy them feel free to share your looks! 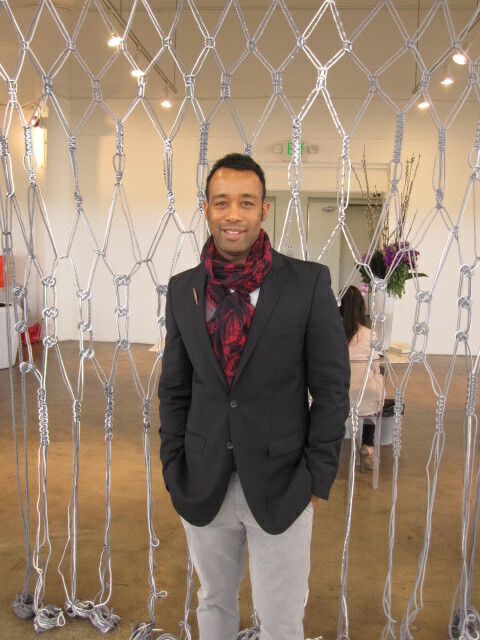 I was invited to attend the COEUR show downtown LA at the Cooper Design Space on March 14th and was happy to accept! Being a first timer to the event, I learned that this is a unique tradeshow with select accessory, gift, home, and footwear collections ideal for artful sophisticates and bohemians. “This show is for the lifestyle individual – they travel, eat at great restaurants and when it comes to items they like great things,” says Henri Myers, Co-Founder of COEUR. I’ve never been to the Cooper Design Space, and I was intrigued by all the showrooms, the antique feel of the building and the friendly greeters at the entrance. When I reached the 11th floor where the event was held, I entered a world like no other where I was attracted to several vendors and the products they offer. When I walked towards the Banago booth I was sucked in by the vivid colors and styles. 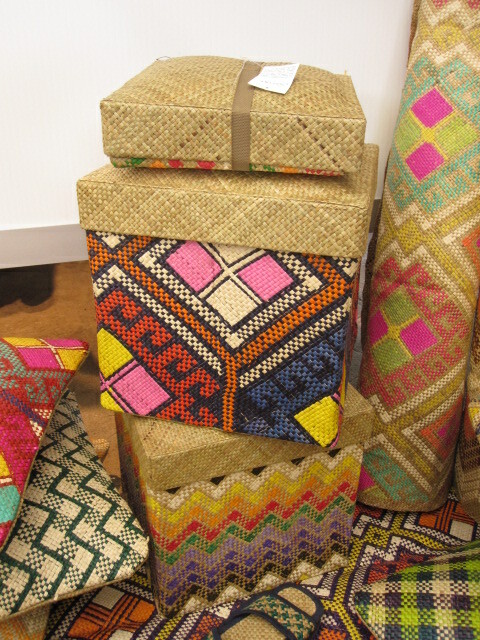 A collection of hand woven bags and home accessories, these items bring “island chic style to the city”. 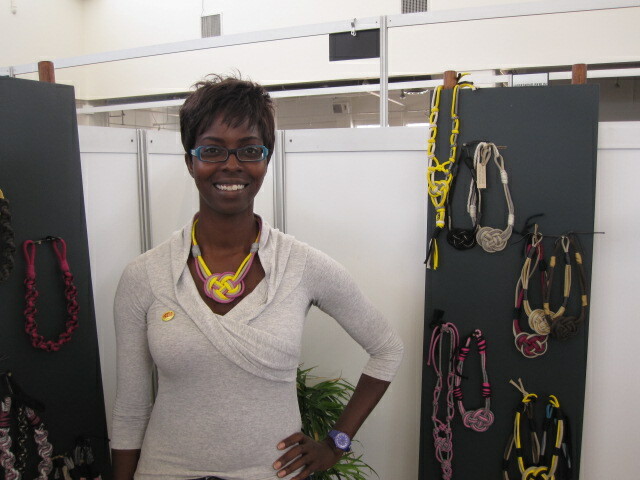 They are hand crafted by artisans in the Pacific Islands with great use of color. I wanted to take everything home with me, but the coolest item that stood out was the collapsible stool box. What I love about this box is that you can sit on it, store items inside, or collapse it flat and carry it to your next destination! I appreciate things that are multi-purpose and easy to move around. 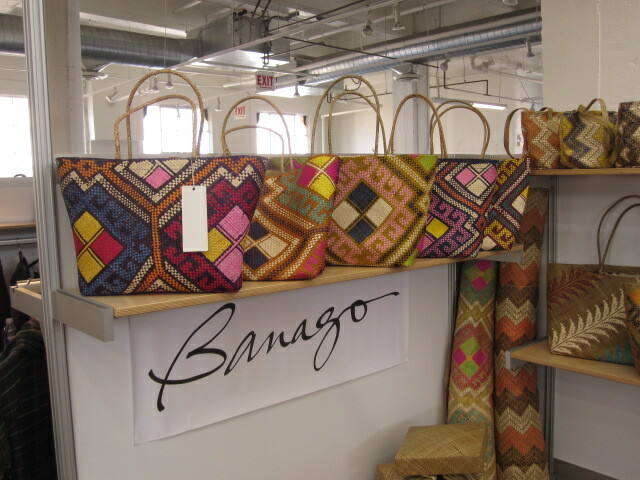 You can purchase Banago at your nearest Anthropologie store. 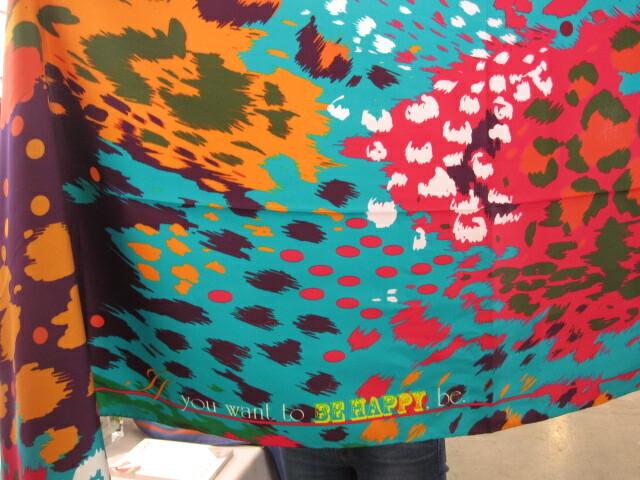 Susannagh Grogan scarf with quote, "If you want to be happy, be"
Feminine, prestigious, luxurious, unique. Those are the 4 words used to describe the scarves made by Susannagh Grogan and I completely agree! These statement pieces are handrolled printed silk scarves where many have a fun quote or motto inserted on them, such as “If you want to be happy, be”. The label was started in 2009 aimed at people who enjoy and appreciate the art of accessorizing and who recognize scarves as the next ultimate accessory. I wanted to wrap myself in many of her bold patterned designs, but the beauty of them is captured when you open it up fully and take it all in. Check out her website for the entire collection. Adding Matters of Space to my jewelry box would be a welcomed addition! This interior design company moved into the product design space 3 years ago and created hand-made jewelry out of reclaimed and recycled textiles and materials, such as silk lame and baby alpaca yarn. I tried on one of the necklaces that went with my outfit and felt like I could pair it with a lot of different things! There was also some of their furniture on display in the lounge area of the event, complete with hanging macramé (see photo of Henri at the beginning of the article). Based in LA with showrooms in NY, Atlanta and Chicago, Matters of Space has positioned themselves as a standout company and one to watch. Always on the lookout for one-of-a-kind handbags, Gräf & Lantz has changed the game by making felt handbags. 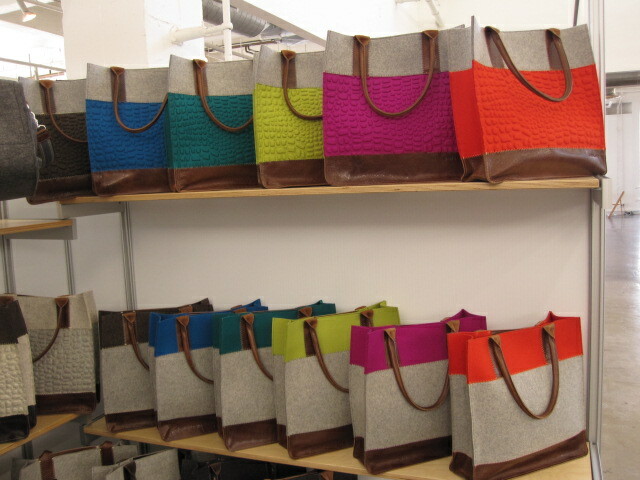 Using custom felts from Germany made of merino wool, these colorful handbags are sure to add a pop to any ensemble. A unique factor of these bags is that they stain and water resistant! That’s a plus in my book that will make this a long lasting staple. Also making other accessories in felt such as an iPad holder, their items are sold all over California. Overall, this was a great opportunity for me to get introduced to new brands that are out there catering to a wide range of consumers that enable you to express who you are and treasure what you have. Looking forward to the next show!